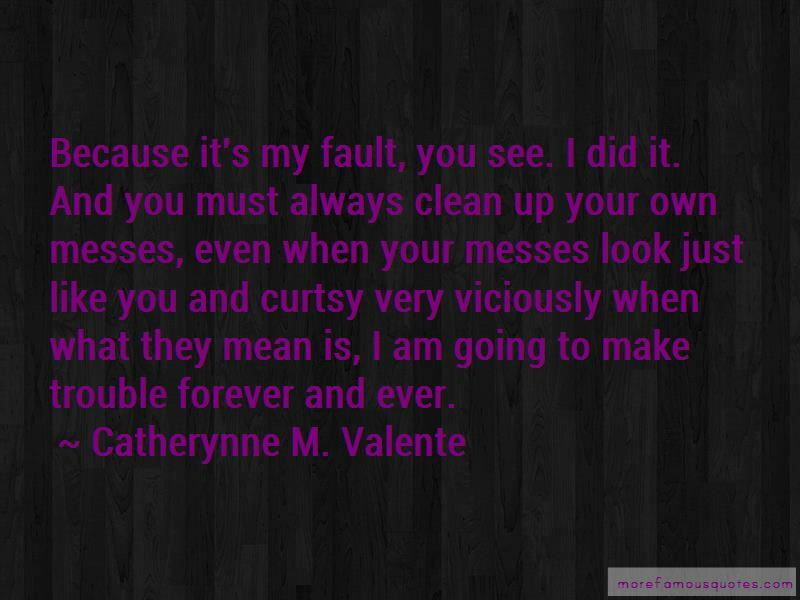 Enjoy the top 745 famous quotes, sayings and quotations by Catherynne M. Valente. Such lonely, lost things you find on your way. It would be easier, if you were the only one lost. But lost children always find each other, in the dark, in the cold. It is as though they are magnetized and can only attract their like. How I would like to lead you to brave, stalwart friends who would protect you and play games with dice and teach you delightful songs that have no sad endings. If you would only leave cages locked and turn away from unloved Wyverns, you could stay Heartless. She is so stubborn, her heart has an argument with her head every time it wants to beat. Someone ought to write a novel about me," said Lebedeva loftily. "I shouldn't care if they lied to make it more interesting, as long as they were good lies, full of kisses and daring escapes and the occasional act of barbarism. I can't abide a poor liar. All money is imaginary," answered the Calcatrix simply. "Money is magic everyone agrees to pretend is not magic. Observe! You treat it like magic, wield it like magic, fear it like magic! Why should a body with more small circles of copper or silver or gold than anyone else have an easy life full of treats every day and sleeping in and other people bowing down? The little circles can't get up and fight a battle or make a supper so splendid you get full just by looking at it or build a house of a thousand gables. They can do those things because everyone agrees to give them power. If everyone agreed to stop giving power to pretty metals and started giving it to thumbnails or mushroom caps or roof shingles or first kisses or tears or hours or puffin feathers, those little circles would just lay there tarnishing in the rain and not making anyone bow their noses down to the ground or stick them up in the air. Your past's a private matter, sweetheart. You just keep it locked up in xbox where it can't hurt anyone. If there are spells, they have a right to weave. I do believe everyone in Fairyland-Below is royalty!" 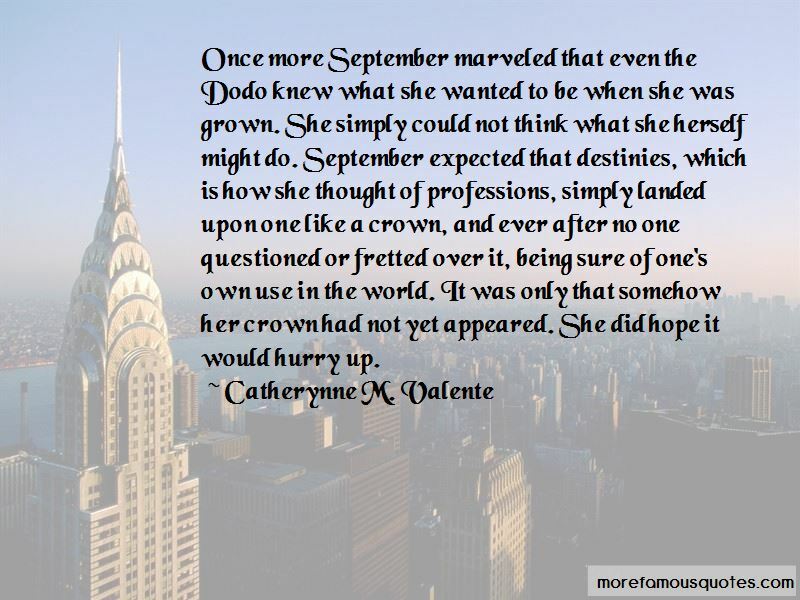 September exclaimed. "Queens and Princes and Vicereines and Emperors - it's like visiting Europe! Oh, September. Such lonely, lost things you find on your way. It would be easier, if you were the only one lost. But lost children always find each other, in the dark, in the cold. It is as though they are magnetized, and can only attract their like. [ ... ] If you would only leave cages locked and turn away from unloved Wyverns, you could stay Heartless. But you are stubborn, and do not listen to your elders. September frowned; she probably did need to hear things which were cruel but true. If they were true it did not matter if they were cruel, even if all her mistakes were laid out before her like rings in a jeweler's box. “She is sad. She does not speak Japanese. Her husband went to the desert months and months ago. Every day she goes to the market and brings back chocolate, a peach, and a salmon rice-ball for her dinner. She sits and eats and stares at the wall. Sometimes she watches television. Sometimes she walks three miles to Blue Street to look at necklaces in the window that she wishes someone would buy for her. Sometimes she walks along the pier to see the sunken bicycles, pinged into ruin by invisible arrows of battleship-sonar, crusted over with rust and coral. She likes to pet people's dogs as they walk them. That is her whole life. What should she dream of?" “Who," coughed Zvonok, "do you think broke your favorite teacup last fall? The one with the cherries on the handle?" "I was careless, Comrade Zvonok. I left the window open and a storm blew through." "Incorrect! I broke it because you left me no cream and no dry biscuits, and when your old boots wore through, you burned them up for heat instead of giving them to me!" "Hear, hear!" the table erupted in approval once more. "Well done, well done!" I'm gonna be good at something other than marrying, darlings. Besides, I don't want them. I don't even wanna screw them, how am I gonna marry them? 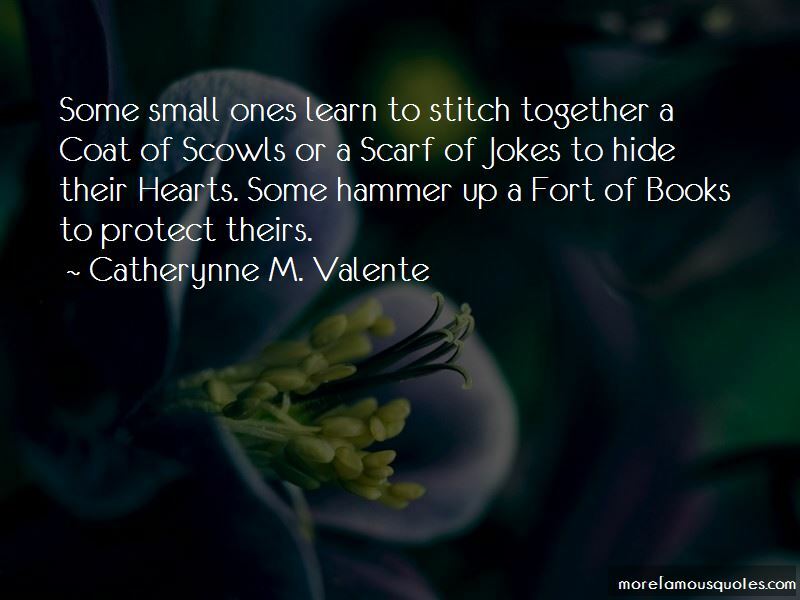 Want to see more pictures of Catherynne M. Valente quotes? 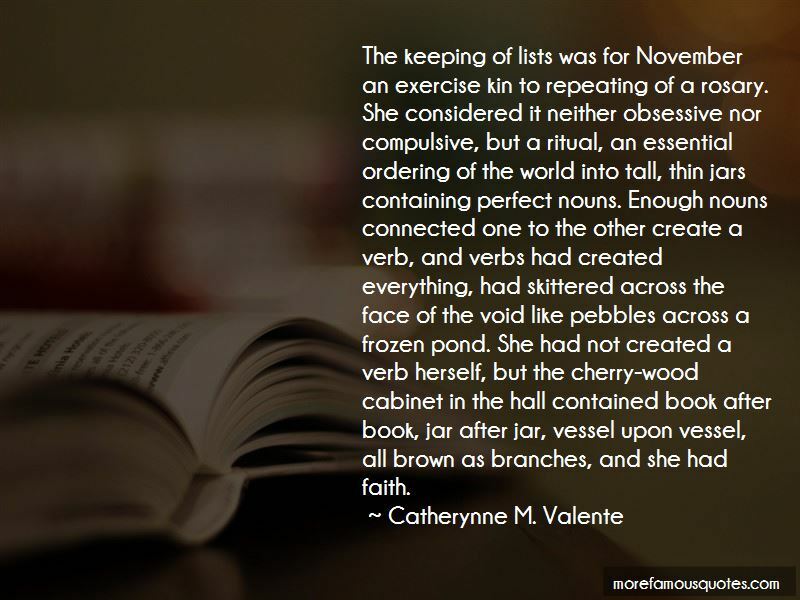 Click on image of Catherynne M. Valente quotes to view full size.